Creativity can be messy. Just take a look through a professional artists workspace - bits of dried clay, wet paintbrushes, costumes strewn backstage at play rehearsal, a songwriter's lyric journal. What is more important to investigate, beyond the messiness of the creative space, is the bigger structure of how creatives interact with and navigate their world. If we can emulate these systems in our classrooms, it's possible to see that (messy) creativity is in fact the perfect model for all learners to use when building a democratic classroom or learning community. What does a democratic learning community even mean? It means creating a community where every member (including the teacher/facilitator) is a learner. It means creating a learning space that is reflective of the experience of everyone in the learning community - even the people missing from that space. Of course it means allowing students (not just the teacher) to have a say in what is explored in the classroom, but it also means encouraging the voices and stories of every member of the community to be heard, documented and explored. Every community member's story is as significant to the curriculum as all that stuff in the textbook. Possibly the messiest of the 5 steps, is the exploration phase. Here, learners will be in discovery mode. The difference between this type of discovery and the stuff that Inspector Gadget, Sherlock or the guys from CSI: Every City in the World does, is that this discovery is documented and made visible to the community. Whether exploring the ways advanced algebraic equations work, the systems of inequity in the school to prison pipeline, or how to blend warm or cool colors of paint, the journey of thinking is to be documented as research. Exploration can also look like prototyping, annotating, brainstorming, challenging, experimenting, and yes, failing (forward). Sometimes referred to as a performance of understanding, creating in the classroom (yes, even the math classroom!) means synthesizing all of the your exploration into a tangible thing (whether written, drawn, built or performed) that is cumulative. This creation provides evidence of your deep understanding about a concept. It can be something created over the course of a month, or something low-stakes that was built in an intense 2 minute period. It seems logical to hang art on a gallery wall, but what if you did the same to a learner's math solution or original hand-written lyric sheet or essay thesis statement? Every creation deserves a plinth, or spotlight, or quick make-shift masking taped frame around it. 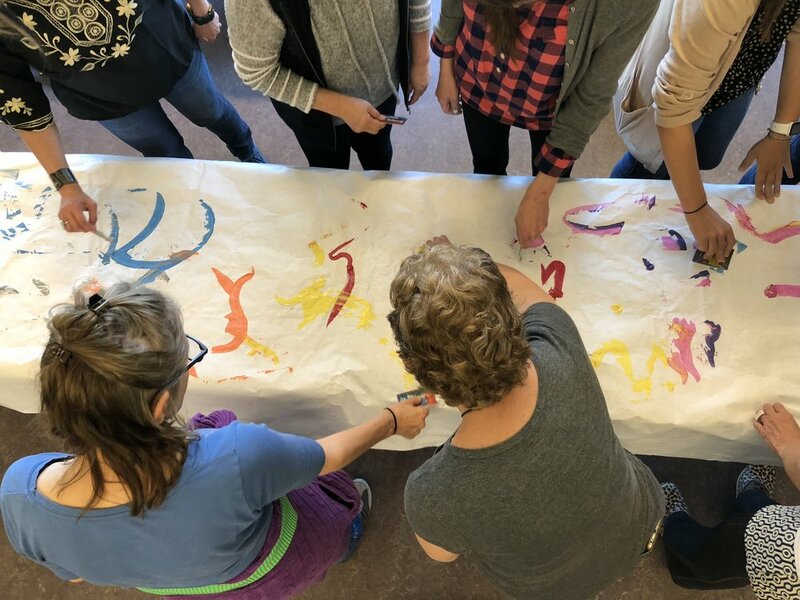 Once the creation is taken away from the work space and is exhibited - then you can invite the community of learners to do a gallery walk. Perhaps this is quiet and slow moving, or raucous and celebratory. Whatever it looks and sounds like, students should no longer be in work mode - but rather in a sort of consumption mode. Ready to look, hear, think, ponder, challenge and dream. The word "critique" can seem intimidating to some, as it invokes a negative connotation, as if al critics do is point out what is wrong. A "critique" according to the Oxford dictionary is an "assessment" but that's another scary-red-pen-underline-conjuring word. I like to think of critique as a coming into dialogue with the creation. Whether this happens in writing, by commenting on a class online site, in conversation, by pop-corning out or asking for longer spoken comments - critiques should be structured using a simple framework or sentence stem (like "I see... I think... I wonder...). More about this and where to find them on another blog entry! Most importantly, just like the exploration and creation steps before this, critiques must be (in the end) documented so that the entire learning community can see. Possibly the most overlooked step, and certainly the most crucial routine to incorporate in order to push learners forward is taking (even just a moment of) time to reflect. When given time to consider "what happened", learners are able to deeply think about "what's next". Without an opportunity to write a few sentences in a journal, scribble a self portrait on a scrap piece of paper, or even just create a simple flow chart of their process, learners will not have the clarity needed to do the next task successfully enough that it has significance for them, or for anyone in their community. And that's it! These 5 steps can be integrated into your community's schedule without taking up a lot of time. In fact - these steps could happen quite quickly after they become practiced and ritualized. The difference between this learning model and others, is that in this model - inspired by the the practice of artists - it ensures that everyone in the community is sharing. Sharing their understandings, their ideas, their questions and - sharing themselves! If you have any questions about these steps, simply comment below or get in touch!